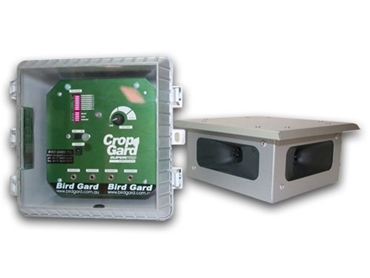 The Crop Gard crop protection system is the first of a new series of bird repelling sound units which use a combination of several completely different and distinct sounds. Crop Gard crop protection system has three major sound categories, namely Electronic Scarecrow (ESC), Screech, and Flower Fruit Scarer (FFS). These sounds can be played sequentially or randomly. Bird Gard recommend the random order to present a more chaotic sound to the birds, which is harder for them to adapt to. As with all Bird Gard sound generators, the Crop Gard crop protection system is fully automatic. It has a light sensor that can be set with the flick of a switch to day, night, or 24-hour operation. Crop Gard crop protection system uses only artificial non-natural sounds (i.e. it creates sounds which no bird has ever heard before). The Crop Gard has four speaker output terminals. It is connected directly to a four way 360º speaker. It also can be used to run a sonic fence (a series of speakers 30m apart) made up of as many as eight speakers thus forming a wall of sound 210m long. Because Crop Gard crop protection system utilises several different sounds, it's like having several different individual sound units all placed in the one position and all working at once. This proves very effective and covers a broad range of bird pest species. In a situation where a grower has a large number of different bird species eating his crop, Crop Gard crop protection system is a wise choice.